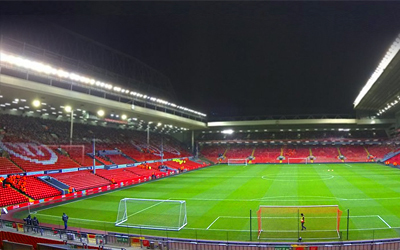 Liverpool's Anfield stadium is the most famous of English football grounds. There is no better place to watch the Premier League than the Kop. You’ll feel the hairs on the back of your neck stand on end as “You’ll Never Walk Alone (YNWA)” is sung with a passion matched nowhere else by football fans on the planet among a sea of red and white scarves. This is history, this is your chance to make history as Jurgen Klopp brings back the glory days to the city. You can’t escape the glorious past as you walk through the Shankly Gates. Get those Liverpool football tickets and be a part of the thrill. With the new main stand increasing the capacity to over 54,000, there’s never been a better time to share your love for the Reds than now! And when it’s all over, the nightlife of Liverpool and Manchester is on your doorstep to complete a fantastic footballing weekend away. Anfield is rocking again. Jurgen Klopp’s enthusiastic management and the attractive football on the pitch have seen supporters flock to a revamped stadium as the team aims to bring back the glory days. Liverpool’s stadium, Anfield, is one of football’s most iconic stadiums, known around the world for the passion and wit of the local fans. Hearing the Kop belt out “You’ll never walk alone” before a match makes the hairs on your arms stand on edge. It’s that fantastic a feeling. Don’t forget to stay to the end when Klopp and the players acknowledge the supporters after the final whistle. A little bit of the Bundesliga in England and a moment when you know that the players understand what it means to play for Liverpool FC. City where the match is being held. As well as its own burgeoning reputation for a great night out, Manchester is close and has a club scene unparalled in the UK. Liverpool don’t operate a match category system. 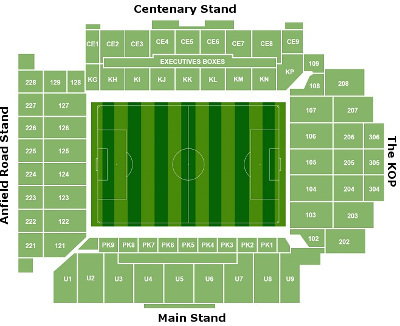 Tickets are priced based on which stand you are sitting in and which tier the seats in. Although the club offer discounts for OAPs and children, these may not be reflected in the pricing on the secondary market. There are four stands at Anfield. The long sides are called the Centenary and Main stands. Opened in September 2016 against Leicester City and saw the capacity at Anfield rise to 54,000. The newest part of the ground, it’s one of Europe’s biggest stands and is visible from all over the city. It has hospitality seating in the middle tier but other supporters get to use their own state of the art facilities It’s a popular choice with supporters as you get to see the players as the emerge from the steps under the Centenary Stand and you’ll be the conductor for the Kop Choir. They wait for your cue to tell them that the action is about to begin. Opposite the new stand is the second long side, known as the Centenary Stand. This houses the dressing rooms, directors’ box and the heart of Anfield: the boot room. A second tier added in 1992 celebrated the club’s centenary and ensured that more fans can see each match. The first short side is the Anfield Road End which houses the visiting supporters (away fans), split into the lower and upper tiers, depending on the match. This is the northern end of the ground – the Main Stand is to the west, Centenary Stand to the east while the second short side is to the south. Saving the best until last, the second short side is the Kop End. Famous throughout the world and beyond, if the heart of Anfield is the boot room, this is the club’s soul. The proudest supporters in the land, the all-seater Kop generates as much passion as the terracing did. Don’t forget to bring your red-and-white scarf to the match; you’ll need to raise it to join in the rendition of “You’ll never walk alone”. The players head toward the Kop post-match to celebrate victory and commiserate in defeat, with club’s loyal supporters. Watching Liverpool from any part of the ground is a great experience. The upper tiers of the two long sides are typically filled with mature supporters and day trippers but you’re expected to contribute to the atmosphere. Don’t expect to stand up very often unless the goals are flying into the opponent’s net, but don’t expect to sit quietly either. You may be higher up in the stand but you will thrive off the energy the lower tiers generate. A word of warning about the seats at the back of the Upper Tier of the newly-built Main Stand. The Hubble telescope might be the best thing to take with you for the game. It’s a long way from the pitch so while you may see these as the lowest priced tickets in the secondary market, there’s a good reason for it. The upper tiers in both short sides offer a fantastic view of the pitch. Unobstructed, you get to see all the angles without needing to rise to your feet when the ball comes toward the goal you’re sitting behind. These seats aren’t too far from the pitch but you won’t be able see which players didn’t shave before the match. If it’s passion you want, then the lower tiers are the place for you. More of the ‘regular’ supporters sit in here and generate the atmosphere for the rest of the ground to feed off. In the Anfield Road End, you have the friction of the sparring between home fans and away fans to build an atmosphere. The two long sides see more of the action close-up with Liverpool using every inch of the famous Anfield turf to stretch their opponents. In the front rows of the main stand, you’ll be able to share banter with the players as they prepare to take throw-ins or free kicks while in the main stand you can share your wit with both benches. Just make sure you bring a sharp sense of humour along with the replica shirts! The Kop doesn’t need that. You walk into the stand are immediately surrounded by history. Don’t worry if this is your first time at Anfield, where the turnstile clicks as you enter, you instinctively know the words to sing every time. Make no mistake, this is the place to be seen when Liverpool play. The camera pans around and your face could be seen by a global audience of millions. Liverpool has a family section, situated in blocks 222 – 224 of the Anfield Road stand (short side opposite the Kop) but unusually for Premier League clubs offers junior tickets in the rest of the ground. If you buy a junior ticket, it must be used by a child under 16. For 17 – 21-year-olds, there are young adult tickets but they must be used by a person in this age range. You can be challenged so take ID with you. Anfield Road - Blocks 126, 127. There are spaces for ambulant and visually impaired spaces in the lower tiers of the Main Stand (long side) or the two short sides, Anfield Road and Kop stands. There are various VIP hospitality options Liverpool has to offer, below are some of the popular ones. The main differences between the packages are - stadium location, food options (meal, buffet), Drinks and beverages options (complementary drinks or cash bar) and the general atmosphere you’re looking for - are you looking to impress a business partner? Have an unforgettable experience with family members, looking for a good balance between price and value? Liverpool has it all. A seat in the executive section of the Upper Kenny Dalglish stand. Delicious buffet served before the game, refreshments, in-lounge betting facilities and more. Fans favourite! Seats in Executive Section of the Upper Kenny Dalglish Stand, table in the exclusive Champions or European lounge, four-course match day menu, Spirits, soft drinks, visit from Former Liverpool FC player, in-lounge betting facilities and more. Seats located at Main Stand lower tier (blocks L11 / L12). Package includes: access to bar, lounge & buy street food, complimentary beer/wine/soft drink at half time, Liverpool former player in lounge & match programme. This package offers a good balance between prices, location and accommodations. Elevated views of the pitch, an exceptional four-course match day menu, Spirits, soft drinks, visit from Former Liverpool FC player, match day gift, free car pass, in-lounge betting facilities and more. This package is perfect for executives who are looking for a classy, high end experience, the package offers a good location and a full hospitality - meal, drinks, parking etc. 4- How to Buy Liverpool Tickets Online? Your best chances are in the secondary market. You have a variety of available categories. Pairs of tickets are also available (WoW guarantee them for all tiers), but for more than a pair or groups – contact us – we have it available in several tiers but not in all categories and not always. However, you should be able to find seats in the same block, reasonably close together. For the big matches, such as Everton and Manchester United, you are struggling but also for games such as Arsenal and Manchester City. And you never know your luck; Liverpool supporters can be accommodating and willing to swap seats with you – it’s a case of being lucky on the day. Midweek matches see a lot of tickets available, but you need to be quick for the Champions League! These are popular matches no matter the opposition, and there’s a buzz about the place which is unique to them. Select your Liverpool fixtures from our events table above or our match menu. You can buy Liverpool home tickets or for Liverpool away tickets. In the review your order page you will be able to review LFC tickets that you have ordered and the total price you will be paying in the next stage if you have been given a coupon or discount code, enter this in the box and click “apply”. The final order amount will be calculated and then click “Proceed to payment”. There are no hidden fees or costs and the total price you see is what you will pay for Liverpool tickets. After payment is successfully processed you will be redirected back to our site and you will receive a confirmation message. An email with your Reds tickets order details will be sent to the email address you have provided during your registration. Liverpool FC is one of the most successful and well supported teams in English football history with a truly loyal and devoted fan base. There are an estimated 200 official supporters clubs in approximately 50 countries. The club was founded in 1892 joining the football league one year later and has played at Anfield since the very beginning. They have amassed an impressive tally of trophies, particularly during the Golden Years of the 1970’s and ‘80’s when first Bill Shankly then Bob Paisley led them to an impressive eleven football league titles as well as seven trophies in Europe. Alas the LFC history has not all been covered in glory, they have also had to endure two major tragedies. During 1985 rioting Liverpool fans caused a wall to collapse, crush and kill 39 Juventus fans at Heysel Stadium which lead to English football clubs from being banned for five from competing in Europe. 96 Liverpool supporters were crushed and killed in the Hillsborough disaster just four years later in 1989. Liverpools neighbours Everton are their major rivals as well as nearby Manchester United. Liverpool FC was born out of a dispute on the committee of Everton FC. Club president John Houlding owned Anfield at the time and Everton left to play at Goodison Park, leaving Houlding to form a new club: Liverpool FC. It wasn’t until the arrival of Bill Shankly on Merseyside that Liverpool’s fortunes really turned He took the club out of the Second Division and laid the foundations for the success of the 1970s and 1980s. Until recently, they were the most successful English club with 18 league titles, 7 FA Cups and 5 Champions Leagues among their trophy haul. Silverware has proven harder to come by in the Premier League era but with Jurgen Klopp at the helm, the Kop hopes to be signing their cherished “You’ll never walk alone” to the champions before too long. 2016/17 was the first step in that direction. Klopp guided the Reds to the top four and a return to the Champions League. The great European nights are set to return and with the club's record signing, Mo Salah, now on board, the vibrant attacking football the club is known for, will be seen by a global audience and in front of a fervent Anfield. 25th May 2005, Ataturk Olympic Stadium, Istanbul. Liverpool arrived in Turkey for the Champions League final against AC Milan as huge underdogs. Milan started quickly. Paolo Maldini scored in the first minute. Andrei Shevchenko had a goal ruled out for offside before a quick double from Hernan Crespo before half-time gave the Italian club what seemed to be an unassailable lead. In the second half, six incredible minutes saw Liverpool draw level before the hour. Gerrard, Smicer and Xabi Alonso turned the match on its’ head. Both sides had opportunities to win the game in normal time and thirty minutes extra-time but it came to a penalty shootout. With Liverpool ahead 3 – 2, Shevchenko stepped up to take his spot kick but Jerzy Dudek saved to hand Liverpool their first Champions League triumph.